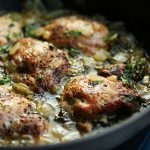 This one pan lemon garlic chicken recipe is easy to make and ready in no time! 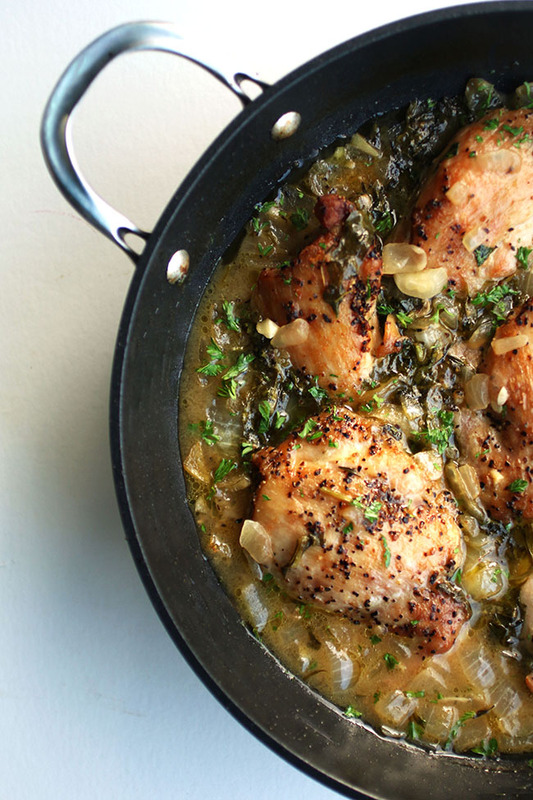 A quick and healthy weeknight chicken recipe that tastes great over rice or pasta. I’m sitting at my desk in jeans and a sweater, and I’m still cold. COLD. In AUGUST. (I know it’s the very itty bitty end of August. But still). I’m definitely not ready to give up my sunny afternoons + beers on the porch + piles upon piles of scrumptious tomatoes, but I have to admit it is kind of nice to be able to turn the oven on again. There’s something about cold-weather food that just warms the soul, you know? I mean, I loooooove summer, but there’s just something so satisfying about standing over a warm stove and breathing in the onion and garlic and herbs and building something up from scratch. And that’s harder to do in the summertime, because, y’know, you’ll melt or whatever. But fall? Fall is when you break out the sweaters and the leggings and the comfort food and the tea and just have a grand ol’ time. 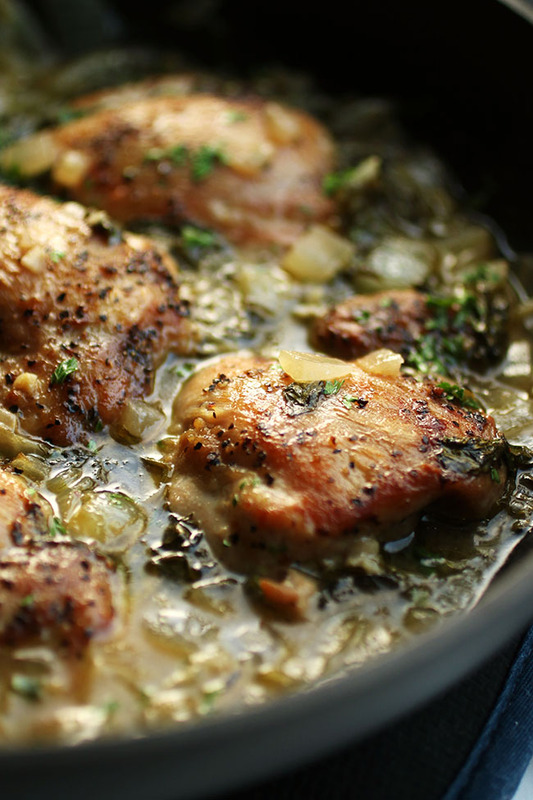 This easy lemon garlic chicken is definitely one of my new favorite fall foods. It’s ready to go in just over half an hour, has a handful of spinach so you’re even SORT OF KIND OF eating your vegetables, and the simple, lemon-y, garlicky broth is perfect for pouring over rice or sopping up with a few slices of your favorite bread. This chicken recipe also makes the house smell ahhhhh-mazing, but it’s low maintenance enough that you can throw it together and still have time for one last cocktail on the deck in the sunshine before we wave goodbye to summer. Mix it up by adding potatoes, asparagus, or carrots and use whatever cut of chicken you have on hand! An easy baked lemon chicken recipe for busy weeknights! Heat olive oil in a large, oven-safe pan (I like to use a wide, deep skillet) over medium heat. Season both sides of chicken with salt and pepper to taste. 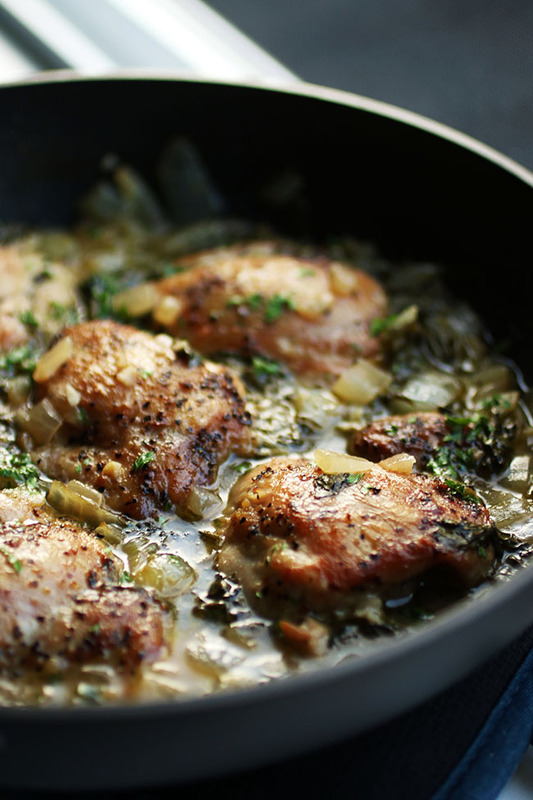 Place chicken thighs in the hot pan and sear for 4-5 minutes on each side until golden brown. 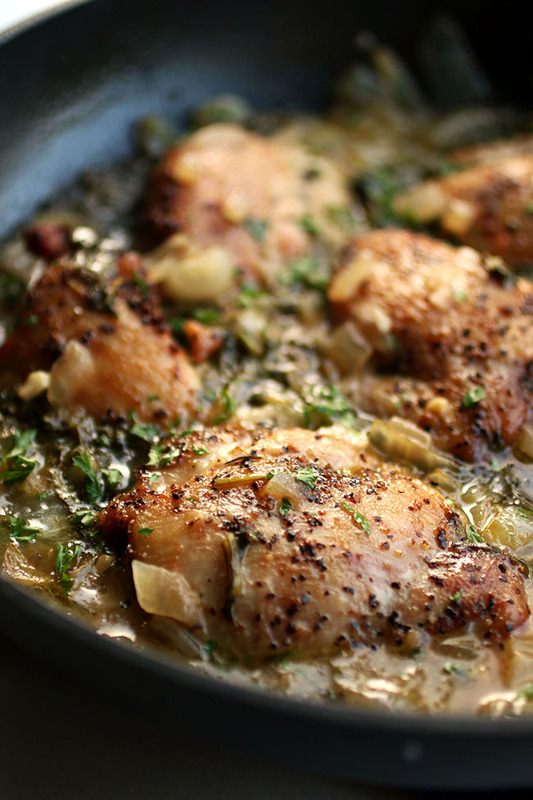 Remove chicken to a plate and set aside, then return pan to stove over medium-high heat. Add onion and garlic to pan and saute until onion is translucent and has started to caramelize, about 4 minutes. If pan is looking a little dry, add another drizzle of olive oil to help the onion cook. Pull leaves off of thyme sprigs and add leaves to the onions, then season with salt and pepper. Juice the lemon, removing any seeds, and add to the onion mixture. Stir to combine. Add chicken stock and spinach to onions and stir to combine. Bring mixture to a simmer, then return seared chicken thighs to pan and spoon some of the broth over the top of them to help them stay moist. Place pan in 400 degree oven, uncovered, and cook 15-20 minutes more until chicken is cooked through. Serve immediately. I used boneless, skinless chicken thighs because that’s what they had at my store, but I generally prefer to use bone-in, skin-on thighs because I feel like they have more flavor. You could also use chicken breasts, drumsticks, or whatever cut of meat you have on hand! Just keep an eye on it as it cooks, because you may have to adjust the cooking time depending on the cut of the meat. 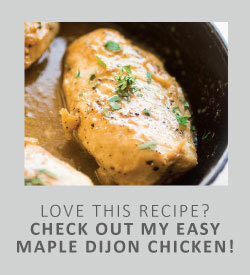 I used chicken stock as the liquid in this recipe, but it would also be great with white wine! Just substitute 1/2 cup white wine for 1/2 cup of the chicken stock. Optional: serve chicken over rice. I try to cook enough of one thing to keep me in dinners through the work week, as I work 10 hour days so when I get home cookin’ is not happenin’. I need recipes that are reasonably healthy, low-carb, full of flavor, and microwave well. This ticked all the boxes and is going into my regular rotation. Thank you! The only changes I made were to add the zest of half the lemon (I love lemon) along with the thyme and finished it on the stove as I don’t have an oven-safe pan. I had to guess at the amount of thyme since I don’t really know how big a “sprig” should be, but it worked out perfectly. I used a “family pack” of boneless, skinless thighs (about 2.5 lbs). Next time I’ll zest the entire lemon and double the sauce ingredients so I can call it soup, but otherwise it’s perfection! Made this for dinner tonight, it was absolutely delicious! Hi Suzanne, wonderful! Thank you. Just wanted to say that if you wrap your skillet/wok/whatever handle with foil, you can put it in the oven easy peasy 👍 Hope this helps somebody out there. Thanks for this recipe; it is simple, healthy and delicious! Hi Cairene – great, thank you! Love this dish. Added a 1/2 cup more of chicken stock because the sauce is so good. Easy and quick and great as a leftover. Hi Mark, YES the sauce is AMAZING! Absolutely loved this recipe…pleased adults and our sometimes picky teenager! We all agreed this will be a new favorite to work into our rotation! It was easy to make, ingredients were simple and it’s full of flavor! Yummy!! What an outstanding recipe. I had doubts but they are gone! Wonderful flavors, assembly is easy, and the diner reaction was terrific! Hi Paul, so awesome! Thank you! Hi Aslyn, thank you and we are always thrilled to be apart of the weekly dinner rotation! This dish is absolutely delicious and so easy to make! My family and I enjoyed it very much and thank you for sharing! Thanks so much for this fast and easy recipe! My family loved it! I will definitely make it again! Instead of regular olive oil, I also used a little bit of both the garlic infused and lemon infused olive oil. Delish!! Hello Cynthia, SUPER! Thank you. I never post comments on recipes but I had to tell you how good this was. Both of my kids loved it. I followed the recipe exactly except I finished the cooking on the stovetop instead of the oven because I didn’t have the correct pan. So good! Will definitely make again. Hello Kristen, WOOHOO! Thank you. My cast iron skillet is not here, so can I use a regular skillet, then bake n a 8×8 glass pan? Can I use frozen broccoli? It’s the steam fresh where u microwave for 10 minutes. If I can use frozen, cooked or not?